stock here -- great YouTube site, they sent boots on the ground to really report and it is REAL. First off let me say this. NONE of the nuclear plants on the Fukushima coast have been restarted, but that does not lessen the risk because of all of the stored nuclear waste that has been gathered and bagged up. Let's get clear on this out of the gate. Prior to Fukushima, The lava lakes in the Kilauea area of the Big Island of Hawaii "drained". Then a week later, the Tohoku Earthquake in Japan. Last week, the Lava Lakes of Kilauea drained almost 1000'. So if another Fukushima style Tsunami hits, all of the expensively gathered nuclear contaminated waste, mostly stored in high tech "garbage bags" will be swept into the ocean and the entire inventory of radiation will be released to the Pacific ocean. If this waste gets swept into the ocean, I predict that the Pacific will be decimated for around 100 years. As it is, it will probably take 30 years to recover the food chain. 3 generations with no Pacific food chain, could cause the mass die-offs to go beyond just the whales, get it???? Tsunami's up to 1000 feet tall. 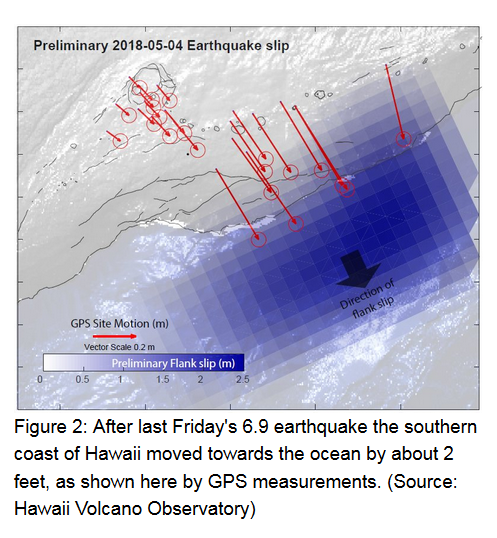 Geologists suggest that a Kileauea flank collapse is the next most likely to occur in Hawaii, that is the Big Island of "Hawaii" the youngest, and therefore the steepest of the islands. This video does a decent job of explaining it, although it states there have been 70 major slide offs in 20 million years. I have studied Hawaiian Geology and it is widely accepted that Kauai made its first "stand" against the ocean about 4 million years ago, putting up massive dyke formations on the Napali coast, which are still totally visible today, and an awesome sight if you know what you are looking at. I have pictures somewhere, probably on mainland now. great report! We are all watching today as the lava has crossed into the energy plant grounds.